This recipe is sponsored by Meyenberg Goat Milk. 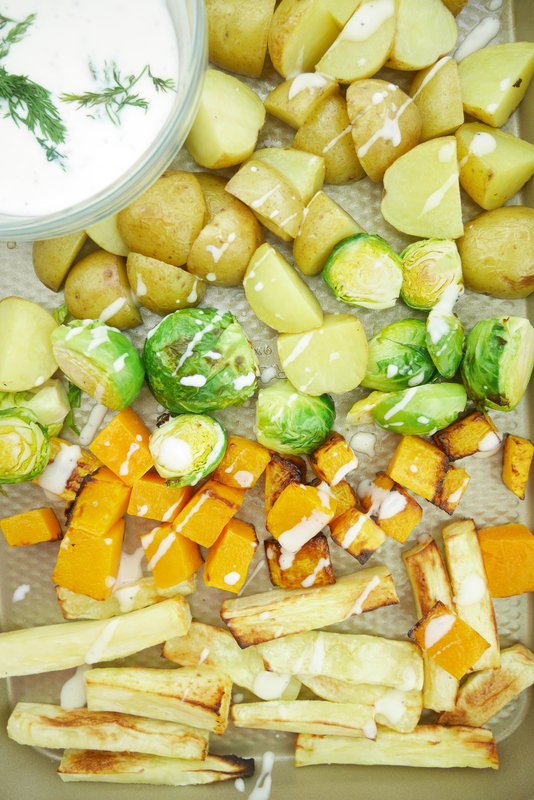 Spring may be on its way, but that won’t stop us from fully embracing winter veggies! These veggies go well with just about everything – your eggs at breakfast or salmon at dinner. Make a batch of these at the beginning of the week and enjoy them with mix and match meals for the next few days. I am all about finding new and delicious ways to eat more vegetables and introduce a greater variety into my client’s diets and mine. More variety means a broader spectrum of vitamins, minerals and antioxidants. One way to do that is with a delicious dressing! 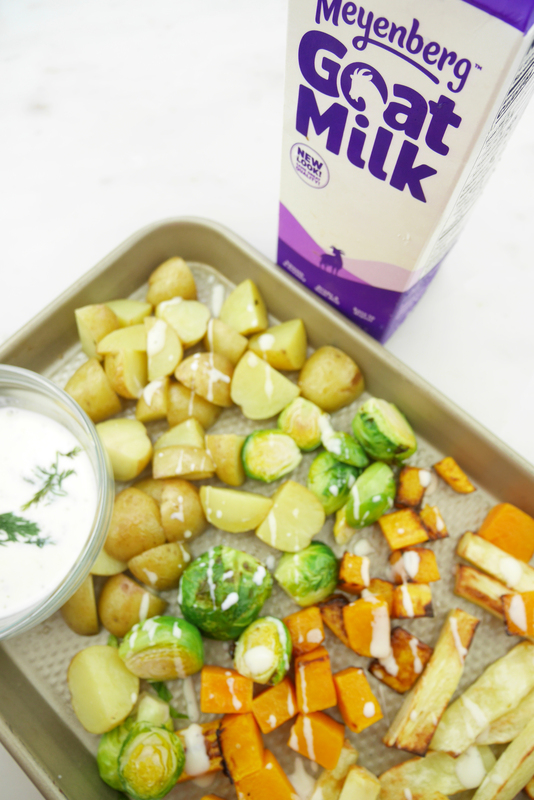 This dressing is made with the best smooth and creamy milk that you may not currently be having – goat milk! 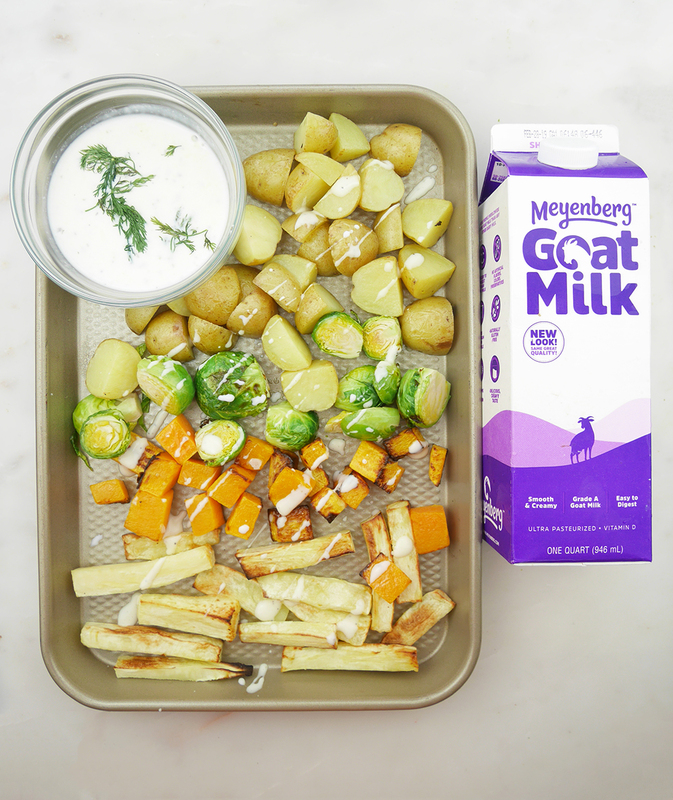 Meyenberg Goat Milk is real dairy and has 8 grams of protein per serving with no artificial colors, flavor or preservatives. Many people who can’t tolerate cow dairy find that goat dairy is easier to digest because of its smaller size fat particles which produce a smaller and softer curd in the stomach. Small, soft curds are broken down by stomach enzymes more rapidly. 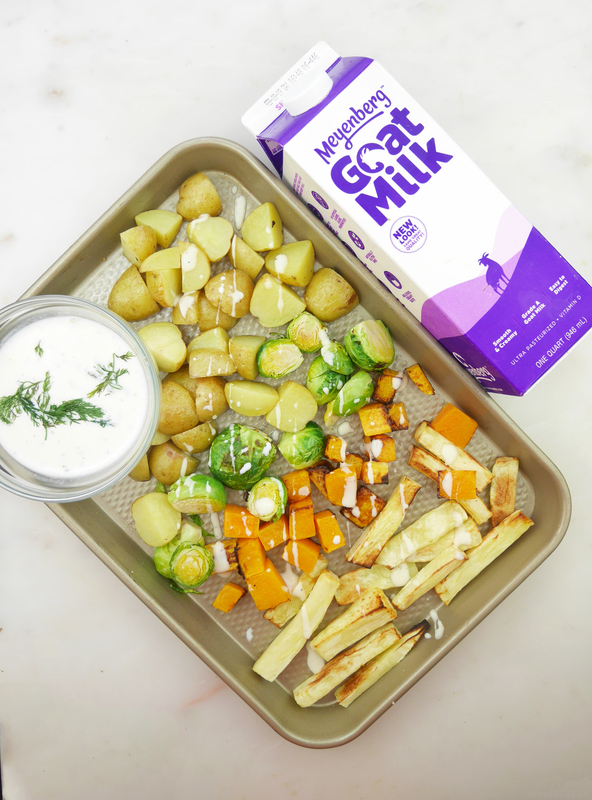 If you make this recipe, be sure to share with me and @MeyenbergGoatMilk on Instagram. 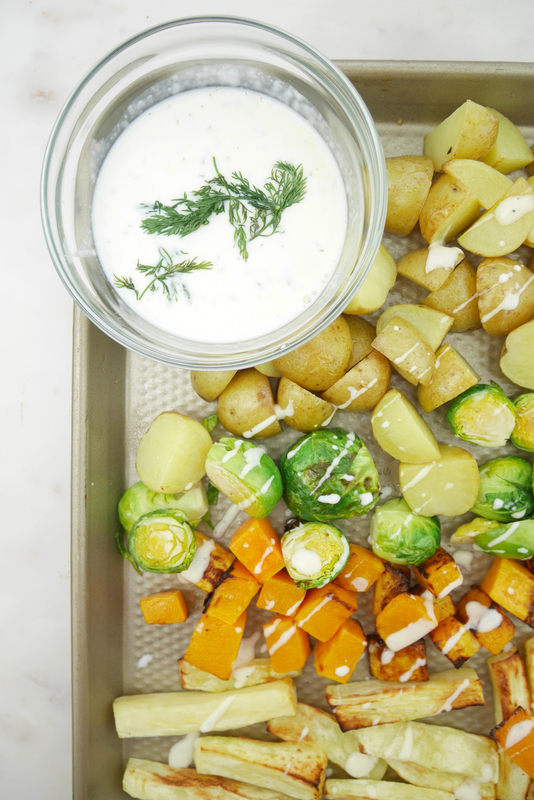 In a large mixing bowl, toss together vegetables with olive oil and salt and pepper. 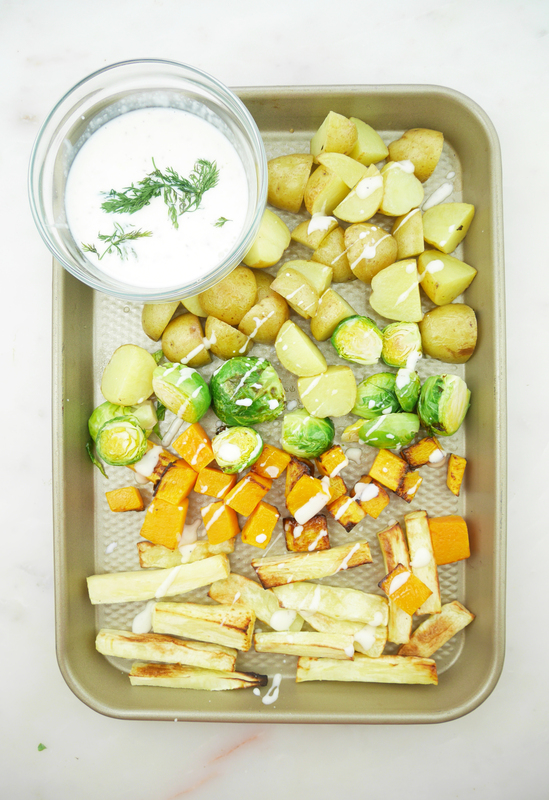 Transfer vegetables to a lined baking sheet and distribute in an even layer. Transfer pan to oven and bake for 20-25 minutes. Add all dressing ingredients to blender and blend until frothy and the mixture starts to thicken. Pour over vegetables before serving.